An Imran Khan supporter in Multan. EPA / Faisal Kareem.Though they have only just garnered international attention, the current protests on the streets of Islamabad started on Pakistan’s independence day, 14 August. Ostensibly fomented by Imran Khan, the former Pakistan cricket captain turned opposition politician, and the Canada-based cleric Tahir-ul Qadri, the unrest came to a head with the brief storming and vandalism of the country’s state TV station. Sharif was elected in May 2013 in elections that were accepted by international observers such as the EU as relatively free, fair, and “competitive”—and which marked the first time that a freely elected government replaced another freely elected government (although there had been alternation in power in the late 1980s and 1990s in Pakistan, governments were dismissed from office by the president, acting in cahoots with the military). Sharif came to power in 2013; his third stint as prime minister, promising reform in civil-military relations. He initially kept the foreign affairs and defence portfolios for himself and still holds the foreign affairs brief. His government has proceeded with a trial against the retired general Pervez Musharraf, despite initial expectations that, after his indictment for treason (itself a first in Pakistan), Musharraf would be allowed to leave the country, probably on the pretence of ill health. But since spring 2014 relations have soured between the government and the military. The negotiations with the TTP came to an end after an attack on Karachi airport in June, with an army operation launched against the group in North Waziristan later that month. The military, under the new chief, Raheel Sharif (no relation), has also grown increasingly concerned about the treatment of Musharraf. Khan initially entered politics in 1996 with his own party, the Pakistan Tehreek-e-Insaf (PTI), mounting a stand against corruption. It did not do well electorally and, indeed, it boycotted the 2008 elections. But during the 2013 campaign Khan returned to electoral politics and projected himself as the face of Naya (new) Pakistan. Back in the game: Imran Khan. EPA / T. Mughal.His campaign was based on an anti-corruption message, and he predicted a “political tsunami” in his party's favour. In the event, his PTI won 9.6% of the seats, on 17.8% of the votes at the national level, and managed to secure sufficient seats in the Khyber Pakhtunkhwa province (the former NWFP) to run the administration there. This was a very creditable result, but hardly the tsunami he had predicted. Both Khan and his supporters, many of whom are young city-dwellers, were quick to cry foul—but most independent observers concluded that the PTI had done remarkably well for such a new party and international election monitors did not question the validity of the result. The power behind the people? EPA / T. Mughal.The army is very probably trying to clip Sharif’s wings, concerned as it is about developments in the Musharraf trial as well as about unwelcome assertions of civilian power over defence and security policy (such as Sharif openly agitating to improve ties between India and Pakistan). And many credit the army with working behind the scenes to sharpen the protests' impact. Suspiciously, many Pakistani TV channels' coverage of the protests in Islamabad has apparently been far out of proportion (according to many Pakistanis) to the number of protesters actually involved. For his part, Khan claimed that a million people would support his demonstration in Islamabad, but in reality, only tens of thousands have—and many of them are supporters of Qadri, not Khan. It might be questioned how these media outlets are able to provide such extensive and expensive coverage without commercial breaks—pointing to a less transparent source of finance. The army has called for a “political solution” to the crisis, and affirmed its support for democracy—but its role as a mediator between the two sides was seen by many as an attempt at a “soft coup”. Sharif is likely to remain publicly defiant, although it’s likely that a deal has already been reached on Musharraf’s eventual departure. A weakened Sharif probably serves the military’s purposes better than would an outright coup: there is little popular support for that, though support for the military as an institution remains high. The army is preoccupied with its operations in north Waziristan, and it knows that it would risk angering international aid donors if it formally took power, so it is possible that its aims will stop here. 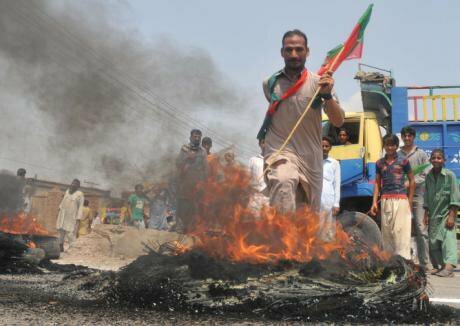 But if the army is directly behind the current protests, as most observers seem to suspect, this crisis demonstrates where power really lies in Pakistan—and is an ominous sign indeed. Katharine Adeney does not work for, consult to, own shares in or receive funding from any company or organisation that would benefit from this article, and has no relevant affiliations.